This resource can be used to practice the skill of representing subtraction equations to Kindergarten or First Grade students. 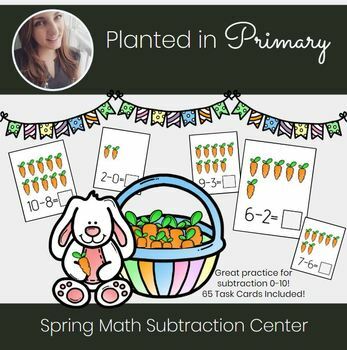 It features 65 task cards for students to practice subtraction equations from 0 to 10. This resource would be best utilized in math centers or as a small group activity. Feedback on this resource is greatly appreciated and helps me fine tune other products to fit the needs of a variety of classrooms! Each page of this resource is protected under copyright laws. You may not use any part of this resource to create another resource. This resource is licensed for a single classroom use only and should NOT be redistributed without the author’s permission. It is strictly forbidden to upload this resource to any internet website. Feel free to share about the use of this resource on blogs and/or social media, but please credit Planted in Primary and provide a link to our website when possible.